Producers, policymakers, regulators, and others interested in the rapidly changing field of climate change policy, carbon credit trading, and biofuels will want to attend an important forum in December on these topics at Kansas State University. “Agriculture’s Role in the New Carbon Economy” is the title of the forum to be held December 17-18 at K-State’s Alumni Center in Manhattan, according to forum organizer Chuck Rice, professor of agronomy at K-State and national director of the Consortium for Agricultural Soils Mitigation of Greenhouse Gases (CASMGS). * Cap-and-Trade: Is federal legislation coming? * California’s Global Warming Solutions Act: How does it impact agriculture? “Policymakers at both state and federal levels are becoming more interested in taking some kind of action on climate change, and agriculture needs to make sure it is involved in the discussion. There are many ways agriculture can be part of the solution, such as soil carbon sequestration and biofuels production,” said Rice. The CASMGS Forum begins at 1:00 p.m. on Monday, December 17 and concludes the following day at 5:00 p.m. The registration fee is $125, if registration is made by December 10, and $175 after that time. The banquet on Monday evening and lunch on Tuesday afternoon are included in the registration fee. The Carbon Credit pilot project offered by the Chicago Climate Exchange (CCX) has recently opened a new signup period. CCX has given approval for aggregators to write contracts for no-till and seeded grass beyond 2010, which was the formal end of the previous phase of the pilot project. The contract for the current signup period is for the 5-year period of 2008-2012, with the option to cover 2007. Producers who sign up their acreage into the program during the current signup period must agree to maintain their land according to contract provisions for the entire contract period in order to be eligible to receive payments. The deadline for the current signup period is Sept. 15, 2008. The enrollment criteria are included in the map below. A. 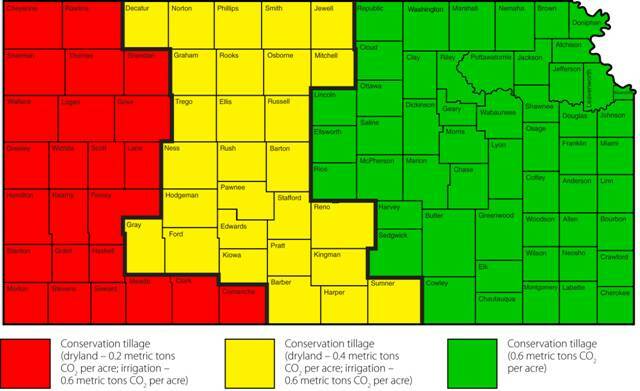 Eastern Kansas counties are now eligible for a carbon credit of 0.6 metric tons of CO2 per acre per year for conservation tillage for the years 2008-2012. B. In central Kansas, producers are eligible for a carbon credit of 0.4 metric tons of CO2 per acre per year for conservation tillage on dryland acres, and 0.6 metric tons of CO2 per acre per year for conservation tillage on irrigated acres for the years 2008-2012. C. In western Kansas, producers are eligible for a carbon credit of 0.2 metric tons of CO2 per acre per year for conservation tillage on dryland acres, and 0.6 metric tons of CO2 per acre per year for conservation tillage on irrigated acres for the years 2008-2012. * Continuous cotton and soybeans are eligible only if there is a cover crop. * In general if the implement would require that a leveling or smoothing activity follow, it would likely result in too much soil disturbance. CCX does not accept new contract enrollments that utilize ridge-till. Also, CCX will not issue carbon credits on row crop land that has the crop residue removed (silage, straw baling, straw burning, corn stalk baling, etc.). This does not apply to alfalfa or grass hay, or grass pasturing. Land on which the residue is removed will receive zero "0" credit for the year in which the residue is removed. * Minimum 5 year contractual commitment. 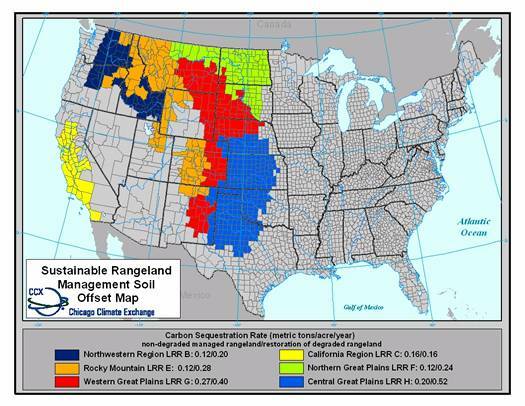 * Non-degraded rangeland managed to increase carbon sequestration through grazing land management that employs sustainable stocking rates, rotational grazing and seasonal use in eligible locations. * Restoration of previously degraded rangeland through adoption of sustainable stocking rates, rotational grazing and seasonal use grazing practices initiated on or after January 1, 1999. * Projects must take place within designated land resource regions. * Offsets are issued at standard rates depending on project type and location. * Rates vary from 0.12 to 0.52 metric tons of CO2 per acre per year. * All projects must be independently verified by a CCX-approved verifier. There are many details and stipulations involved in each of these programs, and producers should review the contract closely. Producers can sign a contract for the CCX program through either the Iowa Farm Bureau or National Farmers Union. Prices on the CCX for carbon credits are currently averaging about $2.00 per metric ton of CO2 equivalent. The aggregators (Iowa Farm Bureau and National Farmers Union) determine when the credits are sold on the market, and take a small percentage of this for overhead. Former Vice President Al Gore and the United Nations IPCC (Intergovernmental Panel on Climate Change) won the 2007 Nobel Peace Prize for their work on global climate change. CASMGS researchers have been involved in many aspects of IPCC work in recent years. For example, Keith Paustian, Steve Ogle, and Rich Conant, with the CASMGS group at Colorado State University, played a lead role in the development of the 2006 IPCC Guidelines for National Greenhouse Gas Inventories, which are used for preparing national inventory estimates by all countries in the UN Framework Convention on Climate Change (UNFCCC). Data from the Colorado CASMGS researchers’ validation/analysis databasewere used to estimate the soil carbon stock change factors incorporated into the 2006 IPCC Guidelines. As another example, Chuck Rice, CASMGS researcher at Kansas State University, was lead author in writing one of the chapters in the most recent IPCC report. Three focus groups make up the IPCC: Group I researched climate systems and change; Group II dealt with human and ecosystem impact from climate change; and Group III focused on how to reduce greenhouse gases in the atmosphere. Rice was in Group III. The IPCC and Nobel Peace Prize are just the beginning of CASMGS’ long-term effort to increase the role of agriculture in greenhouse gas mitigation. NAWG Board Member and Montana Grain Growers Association Vice President Will Roehm testified recently that a “robust, uninhibited offset market” for carbon and other greenhouse gases as outlined in the Lieberman-Warner cap-and-trade bill could provide significant new economic opportunity for farmers. “I believe your proposed legislation takes an important first step in providing the necessary infrastructure for agriculture to be recognized for the immediate, cost effective and real greenhouse reductions and offsets our industry can provide. A number of Senators made positive comments about Roehm’s testimony at the hearing, including Subcommittee Chairman Joseph Lieberman (I-Conn.), Subcommittee Ranking Member John Warner (R-Va.) and Sen. Max Baucus (D-Mont.). Baucus indicated for the first time that he would support the bill, and Warner described a discussion with another Senator, Jon Tester (D-Mont. ), indicating that Tester would also support the bill, in part because of Roehm’s testimony. The Lieberman-Warner bill recognizes the important role agriculture can play in the capturing and storing of greenhouse gases, including carbon sequestration. NAWG supports the establishment of a carbon trading market, which would allow farmers to earn money for practices that sequester carbon. NAWG is also investigating the possibility of the becoming a carbon aggregator.